March 12, 2012: Adam sings Better Than I Know Myself at the Hamilton Live in Washington, DC. "...there's a black woman living inside of me somewhere and her name is Miss Thang." Adam Official: Q&A Answer 4 - If Adam had to rank the following, which would come out on top: ravioli a la Genovese, pizza margherita or nail polish? "I work hard to project pride and poise when faced with judgement and heartache. That is how I cope." AdamOfficial: Q&A Answer 5 – If Adam could collaborate with any designer to create one clothing or accessory who would it be? --@alisanporter good luck on your very special day. I'm there in spirit!! Luv u!! --“@thenameisMASHA: I'm Glad You Came. http://www.youtube.com/watch?v=7N1yymoqWt4” damn girl saaaang! --And check Alex Ghenea's remix on http://www.justjared.com! --@thetings Your new album is so good! 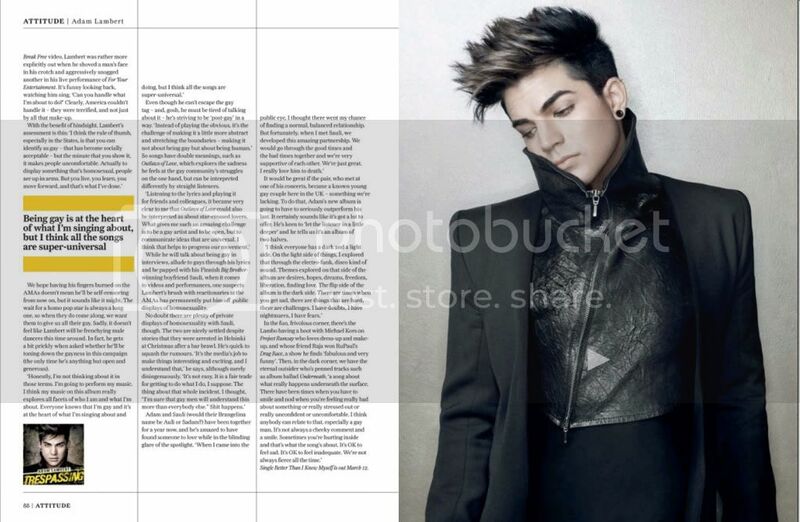 KISS 108 (e-Article/Interview) by Debra Macki: Adam Lambert's "Better Than I Know Myself" Style! MTV ACT: What if Demi Lovato, Adam Lambert, Lady Gaga, were President for a Day? --@RyeRye That 21 jumpstreet track w @theRealEsthero is BANANAS! werk. AdamOfficial: Q&A Answer 6 - What’s the last thing Adam does before he goes to bed? --TRESPASSING Release date!!!! MAY 15th!!!! "...there's a black woman living inside of me somewhere and her name is Miss Thang. --Who saw the Hunger Games? What did you think? --I'm so glad you all like "Never Close Our Eyes"! just to get the rumors straight: Bruno Mars WROTE it but its not a duet. Adam Official: Q&A Answer 7 – If Adam could choose 3 people from the past to have coffee with, who would he choose? --@saulikoskinen1 happy birthday my love!! !